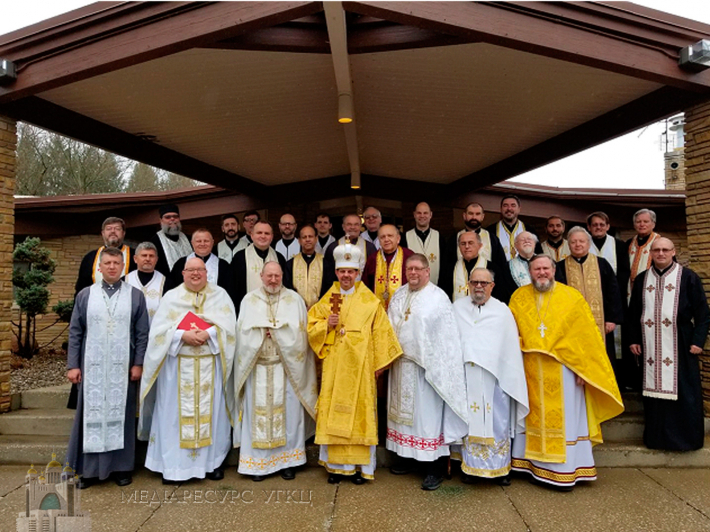 The clergy of the Ukrainian Catholic Eparchy of St. Josaphat in Parma held their annual conference on April 24-26, 2018 at the Loyola Retreat House in Clinton, Ohio (USA). The conference, led by the eparchy’s Ordinary, Bishop Bohdan Danylo and attended by the priests ministering in the eparchy that stretches from the State of Ohio to the State of Florida, comprised a few parts. On the first day, after welcoming the participants, Bishop Bohdan went over the 2017 statistics of the eparchy as well as talked about the pastoral planning for 2018. The day was crowned with a Presbyteral Council meeting, during which the bishop and the council members discussed certain important matters in the eparchy that was followed by the celebration of the Ninth Hour in the retreat house’s chapel. On the second day of the conference, in addition to partaking in the Hierarchical Divine Liturgy and some other liturgical celebrations, the clergy also took part in the discussions regarding missiology and evangelization in the eparchy. It began with Bishop Bohdan thanking all the priests for their dedicated and faithful ministry in the eparchy. The participants’ attention was focused on the vision and pastoral recommendations for evangelization and mission in St. Josaphat Eparchy. The approach to mission and evangelization was centered around the concept of growing Church one mission at a time as well as transferring – metamorphosis – from the Church of maintenance to the missionary Church. Besides Bishop Bohdan, the presenters on the topics of mission and evangelization included Fr. Alexander Wroblicky, Fr. Mark Shuey, Fr. Jason Charron, and Fr. Joseph Matlak. The clergy also heard presentations on the Word of God and catechesis in the eparchy done by Sr. Ann Laszok, OSBM and Sr. Olga Marie Faryna, OSBM. On the final day of the conference, after the celebration of the First Hour and breakfast, the clergy heard presentations on various pastoral matters by Very Rev. Canon Steven Paliwoda, Eparchy’s Chancellor, Chief Financial Officer and Pastor of St. John the Baptist Ukrainian Catholic Church in Lorain, Ohio; Fr. Lubomyr Zhybak, head of the eparchial Office of Children, Youth and Young Adults Ministry, head of the eparchial Office of Children and Youth Protection and pastor of Holy Trinity Ukrainian Catholic Church in Youngstown, Ohio and St. Anne Ukrainian Catholic Church in Austintown, Ohio; Fr. Vsevolod Shevchuk, Eparchy’s Vocation Director, Assistant to the Eparchy’s Chief Financial Officer and pastor of Holy Ghost Ukrainian Catholic Church in Akron, Ohio; Fr. Volodymyr Hrytsyuk, Brother Dale Sefcik, BHS, and Brother David Robert, BHS, members of the eparchial Family Office; and Mr. John Kurey, Esq., Director of the Eparchy’s Stewardship Office respectively. This year’s clergy conference concluded with a Divine Liturgy, presided over by Very Rev. Canon Andriy Hanowsky, Pastor of Sts. Peter and Paul Ukrainian Catholic Church in Cleveland, Ohio, and concelebrated by the attending priests.